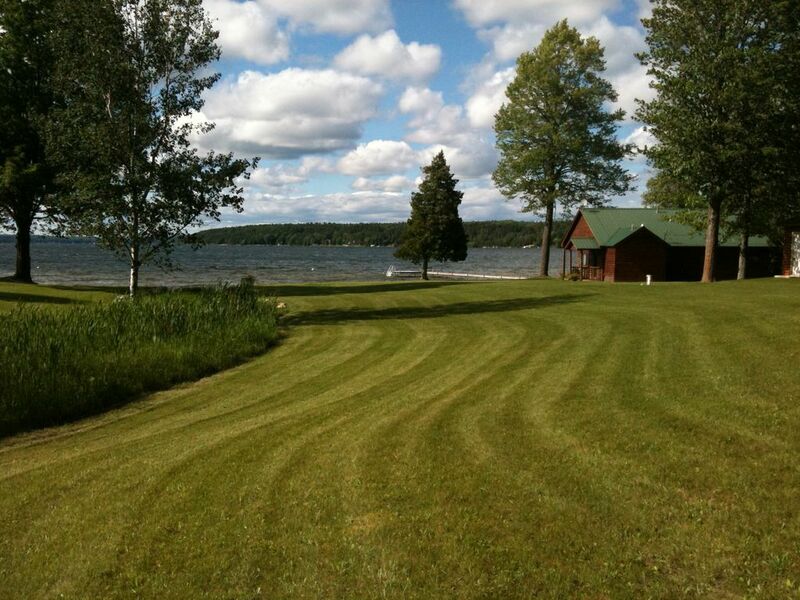 We are located on a 3 acre parcel with private Mullett Lake frontage in Scotts Bay. The evenings bring beautiful sunsets. Roast s'mores at the campfire on the shoreline. The lake has a sandy bottom for swimming. Fish off the dock or children can catch frogs and minnows from the small creek that winds through the property and flows into the lake. Great cottage with amazing lake views! Our family rented this property for the week and had an amazing time. The cottage had plenty of space for our family. The inside of the cottage has a cozy, homey feel. The expansive yard allows for plenty of room for multiple yard games or just hanging out around the large fire pit at night. Swimming off of the dock was a blast! The water in front of the dock and directly in front of the yard is shallow enough and clean enough for everyone to swim and enjoy the water. The views of the lake are beautiful no matter where you are on the property. Jeff, the property manager, made sure we had everything we needed to enjoy our week at the cottage. When we arrived, the cottage was clean and there was no issues with our stay. Between the nice cottage and the service that Jeff provided, we will absolutely be staying at this property again. Thank you for everything! Great in every way! Clean, roomy, good parking, right on the water. just as described, wonderful service by the rental agent, lots do do in the area, including Mackinac Island. The weather was ideal. Three large great rooms with cable and big hd tvs. Five bedrooms, three with king beds. Three full bathrooms. Big kitchen and three eating areas. Evenings around a fire at the Sandy Beach. Way cool. This Warm and welcoming Cottage is perfect. Starting with the great communication with Jeff, the Property manager. He makes this so easy, with the cottage being clean, and maintained so well, it is easy to drop your luggage, grab a drink, and just relax! This cottage allows the kids direct access to a small beach and water, for hours of sandcastles, and swimming. The dock is perfect to sit out on and watch the sun set. In addition, to bring the boat in closer so all can enjoy boat rides on some of the cleanest clearest water in Michigan. The Cottage Has everything that you would need, and is still close enough to town for the things that you forgot to pack. This place is so perfect that the kitchen allows everyone to come and sit for dinner. We enjoy this place so much that we can wait until next Summer!!! Very scenic, serene spot to spend a vacation! This is a great place to drop your cares away. Beautiful view of sunset every night. Deck is great even if it rains with a portion of it covered. Lots of side yard to play outdoors. Swimming or just floating and a mooring for a boat. Campfire pit to end the day! Jeff will welcome you with a call to make sure everything meets your liking. He will answer any questions and is very easy to talk to. Nice grocery not far in Indian River. Great restaurant called Pier 33 a short drive to the north. Beers @ the brewery in Cheboygan. We've had some really nice vacations here. Wonderful stay at an amazing cottage home! Cottage was well equipped, clean, and easily accessible by road and water. The six of us had a wonderful time enjoying the lake and many attractions near and far. Our four days were packed with activities and every day we ended the day with a respite at the cottage. We used the tubes for floating in the lake on the very hot day, thank you! Jeff was pleasant and easy to communicate with. Cross in the Woods and their gift shop.